Coming up with a digital marketing strategy for your business is a challenging task, especially with the changes happening to digital today. In order for your digital strategy to be truly effective, you have to factor in what can change in the future, and how your business will evolve in the foreseeable future. Your digital strategy will serve as a clear guide to establishing your brand online. This helps you avoid making decisions on the fly while allowing you to take calculated risks when digital does – and it often does – change. One of the biggest mistakes you may be making when beginning to develop your digital strategy is to think it is the same as your business strategy. 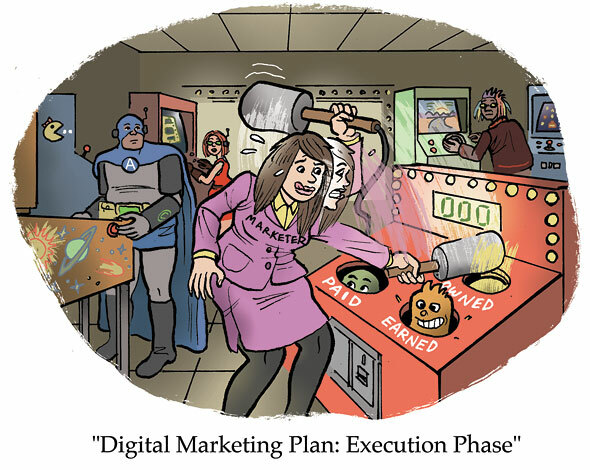 Many things you will find in your business plan cannot be applied to your digital strategy. Technology changes at a very fast pace. Every season, new gadgets and software are introduced to the market. Existing technology gets updates regularly as well, and you never know when a major update is in the works. The strategy you create should allow maximum flexibility. Allocating resources is difficult when dealing with such a fast-paced area of marketing. Instead of forecasting, try to create rules for budgeting for digital marketing instead. Because of the nature of digital, you need to focus on creating policies and priorities for all people, whether today or in the future, who will be contributing to your digital marketing activities to some capacity. People. Establish who will be responsible for decision-making processes and who will handle implementation and quality analysis. The document should clearly outline the responsibilities and limitations of each person who will be taking part in the digital marketing process. You also need to detail what tasks you will be doing in-house and what tasks you will be outsourcing to us to save time and resources. Policies. Determine what decisions will need to be made regularly, what your take is on each, and turn these in to solid guidelines that will serves as your policy. Proper brand messaging and online representation, use of logos in different web properties, and definitions of what appears on what pages are examples of things you should include in your policy. It should also include your quality standards, testing requirements, and crisis management plans in case something unexpected happens. You’ll need to update your policy as changes happen in your organization and in the digital world, and every time you add a new technique to your existing digital marketing strategy. Priorities. This part of your document covers your business objectives and your target audiences. Creating and prioritizing your digital business objectives is relatively easier – this is usually aligned with your overall business objectives, which you would have already established before setting up shop. Still, prioritizing business objectives with the digital target audience in mind proves to be a challenging task for many. Determine which of your priorities will clash, and decide what you will prioritize in the process. This allows you to create a roadmap for your marketing activities later, which we can follow. Its most practical use will be when you are maintaining your campaign, where you may have a different team handling your marketing from the original team that started it. This will help avoid conflicts and put urgent tasks in front, regardless of who is handling your marketing at the moment. While it’s true that you can’t plan years ahead, you will still need to create a primary roadmap which will serve as our guide, at least for the next few months or so. Focus on the areas that need to be done immediately, and discuss these tasks in detail. Non-priority items may be discussed in less detail, especially those that will be done far ahead. This leaves room for any changes that may take place between then and now. Website. Include details about the design and features you want on your site, and a content plan as well. Decide who will be responsible for site maintenance, assigning people for design, content, and technical updates. Mobile. This should include details about mobile web design and mobile apps. Today, having a mobile website is the minimum requirement for businesses that want to be visible across the market; having a native app is still your discretion. Indicate what platforms you will support. Digital Marketing. This part will be more extensive because it includes everything, from SEO to PPC, banner and retargeting ads, affiliate schemes, and content marketing. This part of your campaign changes as Google updates its algorithms, so remember to leave enough room for sudden changes in case a major update is released. Social Media. Decide what social media platforms you will be using, what you will be using it for, and what content you will be presenting in your profiles. You’ll also need to create policies on messaging and handling negative press through your social media profiles. Email marketing. This includes all emails you send, whether it’s a newsletter or an action-triggered email. Determine who will handle your email marketing campaign, who will be in charge of responses, and what procedures you will follow to acquire and protect the information of your leads. You can’t talk strategy without determining how much of your resources will go to different areas of your digital marketing. You’ll need to determine what a reasonable price is for the in-house projects that you have, and what the reasonable price is for the tasks that you do outsource to us. The most important thing to remember is that digital marketing isn’t a one-off service that you can stop once you’re done creating the website. It is an ongoing project that continues being developed long after you’ve finished your business website. With that in mind, you’ll need an agile pricing structure that allows adjustments where necessary. If it sounds vague, it’s because the very nature of digital marketing prevents you from setting a fixed price on digital marketing. The budget that you will allocate depends on your resources, your desired services, and on what tasks you do in-house and what you will outsource. While you may not come up with a set amount, what you can do is to determine what you are willing to invest in order to see if the results you want to accomplish and the tasks you want to get done can be accomplished within your budget limits. Creating a digital marketing strategy for your business is tedious work, but it is a necessary task that puts your entire online marketing campaign in order. We’d be glad to help you create a digital strategy for your business. Talk to us today to get started.